Blue 42, Blue 42, HUT HUT - touchdowns, tackles; helmets crunching and plays that make us all get up and yell. The game is fast paced and you can go from yelling “DE-FENSE” to “FIRST DOWN” in a matter of a few seconds. Do you have a hard time keeping up with what down you are on or what the score is? That is where we come in. Our most basic boards offer game time, score and quarter. 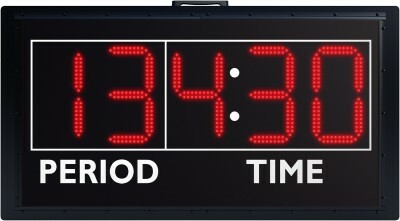 The more advanced boards offer everything from possession; downs; to go, ball on and T.O.L.. We also offer portable and permanent delay-of-game (DOG) clocks. We offer personalized boards with your team’s logo. Add in an arch, sponsor panel or wireless remote control to individualize your scoreboard and make it perfect for your program. The perfect football practice segment timer for every high profile football program! Large 13” red displays are visible from over 300 feet. Our most compact football scoreboard, the brand new 7430 features 15" super-bright LED displays and shows all the basic game information. Our most compact football scoreboard, the brand new 7150 features 15" super-bright LED displays and shows all the basic game information. The 7416 features 15" super-bright LED displays and shows all the basic game information. 16' x 5' x 8"
Your scoreboard says a lot about your football program, and the 7420 makes quite a statement! 20' x 8' x 8"
The 7520 features the same game information and 20" displays as the 7420, with the addition of a 1/10th and 1/100th track timer. The huge, 24' wide 7424 features all of the same game information as the larger 7428 except the Time Out Left displays. 24' x 8' x 8"
The 7524 features all of the same game information as the larger 7528 except the Time Out Left displays. The 7428 features all the deluxe football game information as well as a large central area for optional team name/logo. 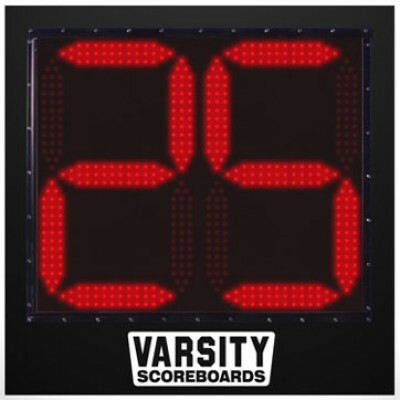 28' x 8' x 8"
Our largest portable scoreboard is perfect for scoring soccer, football, field hockey, lacrosse and many other popular sports. 52" x 68" x 8"
Nearly identical to the 7428, the 7528 adds a 1/10th and 1/100th track timer. 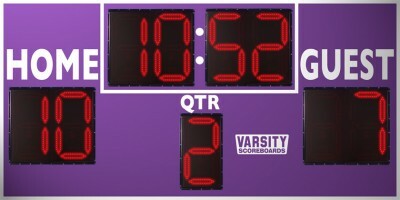 The 7436 Football Scoreboard features all the deluxe football game information as well as a large central area for optional team name/logo. 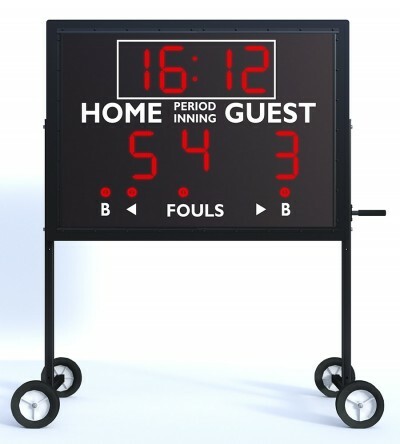 36' x 10' x 8"
Our delay-of-game clocks feature the same steel construction and finish as our scoreboards and feature 26" displays. 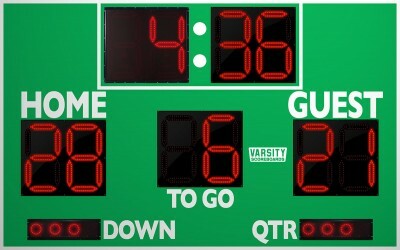 Clocks operate from a Varsity football scoreboard.